Izzy is about to finish week 8 of Ambleside Online's year one. It's taken us about 11 weeks to get through the first 8 weeks, because of summertime activities/trips and my being pregnant which has required some rest here and there. Once we finish the work for this week (which won't take us all week - I decided to spread out week 8 over last week and this week), we will be taking a break. Baby girl #3 is due next week (!!) and we'll take some time to *hopefully* rest and finish any preparations before her arrival. Anyway, here are some of my reflections from the year so far. This is more for me, but maybe something will be helpful for someone. We read our first Shakespeare tale from Lamb's Tales from Shakespeare, A Midsummer Night's Dream. I think it took us five separate readings to get through it, at 10 or 15 minutes apiece. The first two readings were pretty painful. The stories are lovely, but the language is pretty difficult, and Izzy was lost during most of the readings. As a result, I searched around on the AO forum and followed the advice of some other moms who use puppets when reading Shakespeare. We have some puppets, but not enough, so instead we used some little toy figures that the girls have accumulated over the past few years. Just So Stories is just a little difficult to read aloud, in my opinion. So, again, I browsed the AO forums, and some had suggested using an audio book for this one. Thankfully our library has it on audio, read by Jim Weiss, who is a fabulous storyteller. I've just been checking it out when Just So is on the schedule, and Izzy's narrations have been much better using this rather than listening to me. We originally began Izzy's reading lessons using the McGuffey Primer and it was going alright, but honestly, it was kind of boring. So I decided instead to do the lessons using Charlotte Mason's methods, and now Izzy has declared that her reading lessons are her favorite! She looks forward to them each day. It's been a little slow-going, but that's one of the (many) reasons why homeschooling is awesome. There's time. Time to allow the child to learn at her own pace. Time to allow her to really understand what she's learning, and not be left behind in the process. The Joyful Shepherdess blog has a good outline of CM reading lessons, and an AO mom has also written a guide for teaching reading this way. You can find the guide on AO's website. Twice in the past week Izzy has, out of nowhere, picked up one of her school books and asked to read it! We were about to do school one day and she ran over to the shelf and grabbed The Burgess Bird Book by Thornton Burgess and got all excited about reading it. Unfortunately, it wasn't on the schedule. I guess technically there's nothing wrong with reading it on an unassigned week, but I told her we'd have to wait :( I don't want her to get in the habit of thinking she can choose whichever book she wants. Maybe when she's older. By the way, this book was not a favorite of hers the first few weeks. We were reading it off the kindle, but I decided to just go ahead and purchase a hard copy because it's such a wonderful book and since we won't be reading every chapter this year, I wanted it available for her to read later on, or for us to read together as a free read. I guess having the hard copy made the difference, because she loves this book now. I also went ahead and bought a hard copy of The Blue Fairy Book by Andrew Lang as well for the same reasons. So now, the only books we're reading off the kindle are Fifty Famous Stories Retold by James Baldwin and Parables from Nature by Margaret Gatty. I'm okay with reading Fifty Stories off the kindle, because the stories are so short, but I'd kind of like to have a hard copy of Parables. I just haven't been able to find a copy at a decent price! The other book Izzy picked up and wanted to read was D'Aulaire's Benjamin Franklin. Man, what a great book! It is beautifully illustrated and written so well, as are all of D'Aulaire's books. Unfortunately, we don't own any of them because they are pretty pricey and it's very difficult to find them used at a decent price. So for now, we are checking them out from our library. We've always read aloud to our kids and both of the girls love to read (well, be read to), but it seemed that at first Izzy was not too excited about the "school" books. But the AO advisory has done such a wonderful job choosing great living books and I'm just excited that Izzy is beginning to really enjoy them! Although, with almost every book we pick up to read, whether it's a school book or not, she asks, "Do I have to tell it back?" Ha! So in my last post about year one, I mentioned that I needed to have a better idea of how to give Addy (4) more attention now since I'm spending so much one-on-one time with Izzy. A few things have worked really well so far. First, I gave Addy her own "school" binder with some things for her to work on if she wants. 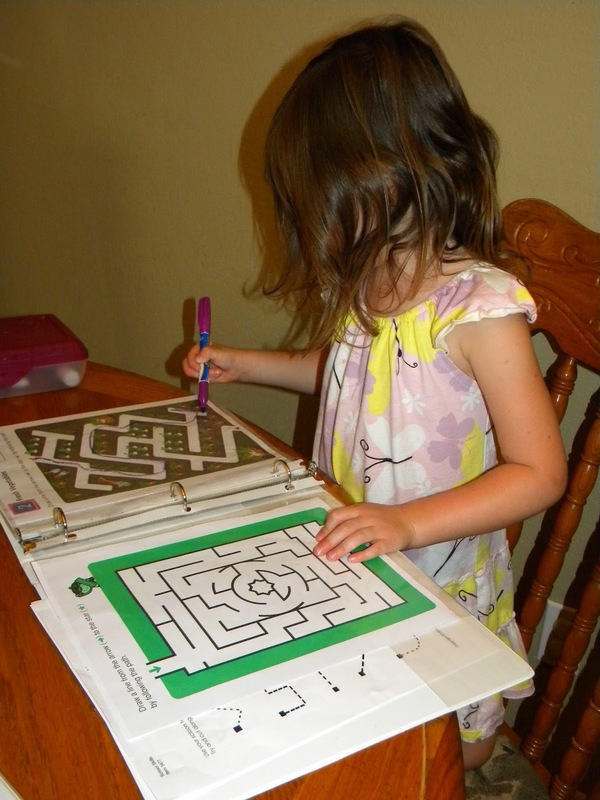 She was so excited to have her own binder :) She and Izzy both love mazes, so I bought a Kumon maze workbook, tore a couple mazes out, and put them in sheet protectors so that she can use a dry-erase marker on them. The workbook is full of mazes, so I'll switch them out every so often. I also put some dot-to-dot and cutting practice worksheets in her binder, but she mostly does the mazes. I also put some different activities in storage bins for her to pick from each day - dry-erase letter/number practice, puzzles, coloring books, etc. 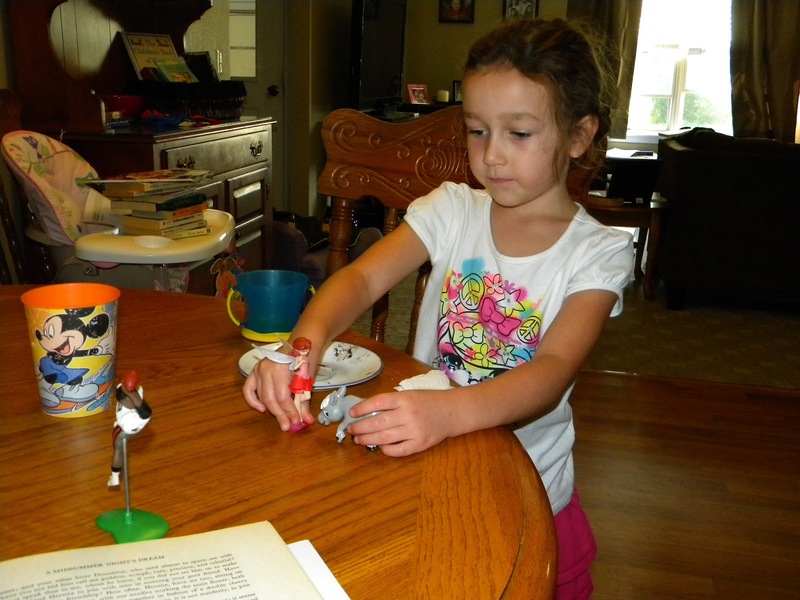 When I sit down with Izzy each day, I tell Addy that she can join us with her school stuff, or she can play. I never require her to do "school" stuff, but she usually hangs out with us for a little while. She loves to do the mazes and the dry-erase letter tracing. The other thing that has worked really well lately is we've been starting school with some read-alouds. I have Addy pick out a book or two that she would like me to read, and I read to her first. Izzy will usually do her copywork while I read to Addy, then I'll read Izzy one of her school books, and Addy can continue to sit with us and listen if she wants - sometimes she does, sometimes she doesn't. This way, she gets some attention from me before I sit down and do other subjects with Izzy. It's definitely helped her feel more included. Well, that's probably good for now! How is your year going? ?